These Stories is a lucid dream that reflects upon the complexities and contradictions of reality, atmosphere and place, loss and hope. The work is a mind and memory puzzle. It uses the narrative language to juxtapose an uncanny¹ symbiosis of events, a doubling of memory and presence, an invitation to see between the lines of what is in-front of us and what might be there. 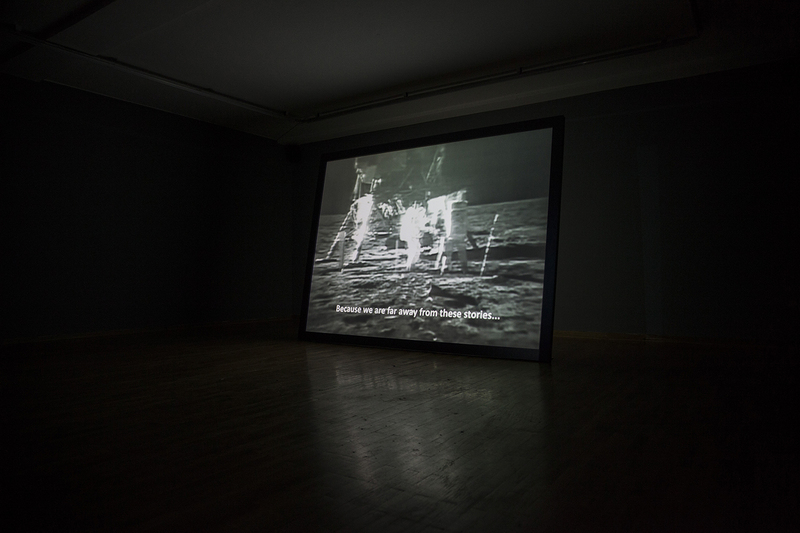 The Video Installation, combines the original Apollo 11 mission video footage, and the audio narration of Sadik Cena b.1956, a close family member of mine. His story relates to the the same period of NASA’s Lunar Mission. A radical change occurred in the lives of many families around Kosovo, including mine. At the same time Neil A. Armstrong stepped on the surface of the Moon, electricity network reached our village, thus benefiting very late from the electrification process during the ex Yugoslav economic development program. The work questions the importance of these two separate events, by merging the Memory into a single History. While the video shows perhaps the highest achievement of humanity, the audio voice reflects on the parallel impact of something just as important as the first one, starting from the very personal history. Doubting not only the Moon mission, but also its importance in a given space and time.